Now you can bring Calypso the Narwahl with you wherever you go! Ty Flippables Clips snap easily onto backpacks, suitcases and more, making them the perfect school or travel companions. Make a big splash with friends with this colorful plush narwhal by your side. 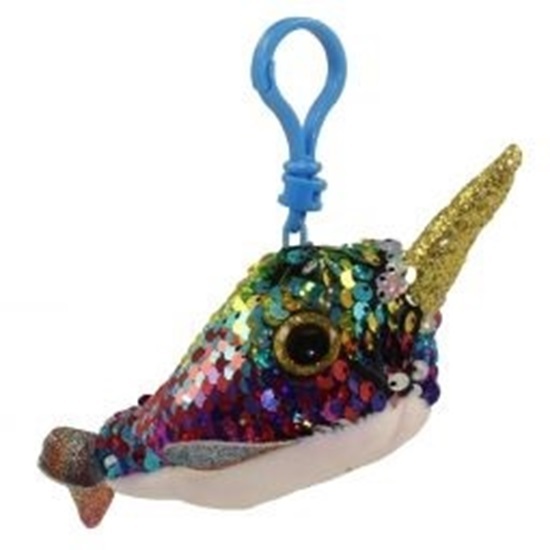 Rainbow sequins with a shiny gold horn give this small stuffed animal dazzling appeal. Then brush your hand up and down on his reversible sequins to make him change from multi-color to sparkly silver. Calypso is approximatley 3.5 inches tall and is perfect for ages 3 and up.